A celebration of design, decor and happy little things. Skip the standard egg dying kit and make your own Easter egg dye using veggies and spices you have in your kitchen. 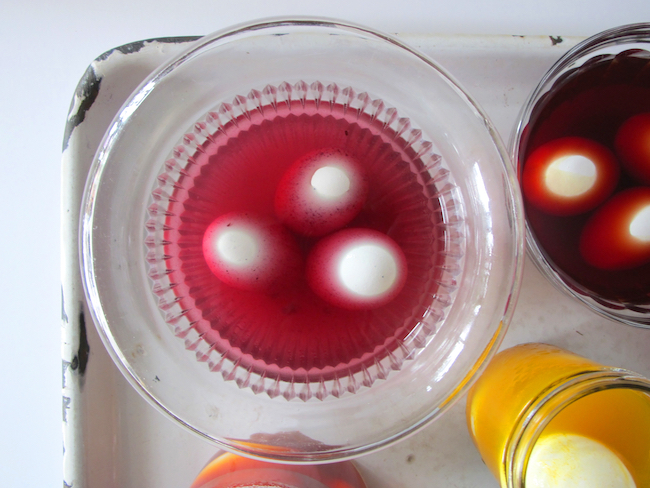 Natural egg dye is easy and more eco-friendly using vegetables, spices and berries to create just about any colour you want. 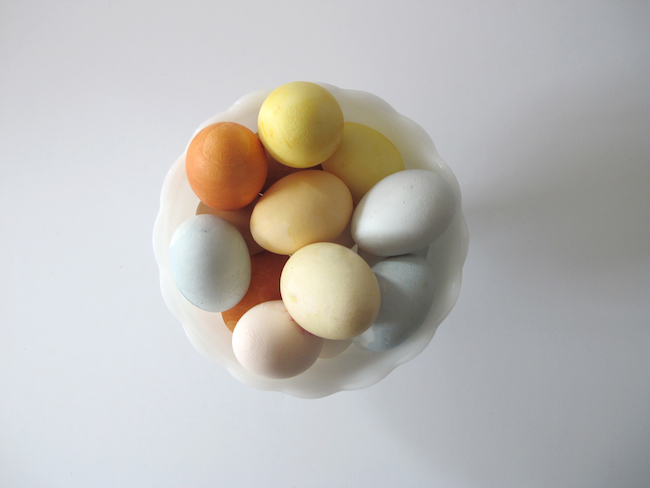 Use these all-natural dye recipes made using ingredients from your pantry to create Easter eggs in pretty, subdued shades of blue, green, pink, yellow and orange. We love that it is an eco-friendly alternative that uses natural ingredients without food waste because you can eat eggs free of toxic dyes. 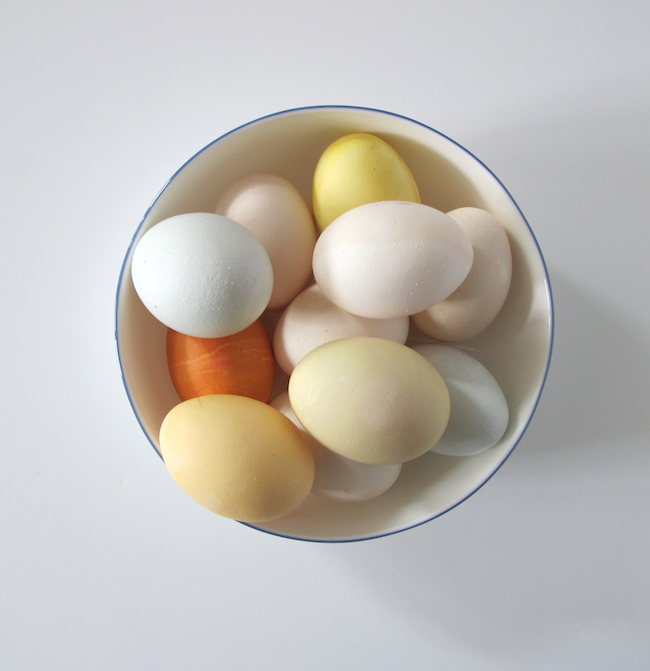 Keep in mind that when dying eggs using all-natural ingredients the results will vary from batch to batch. 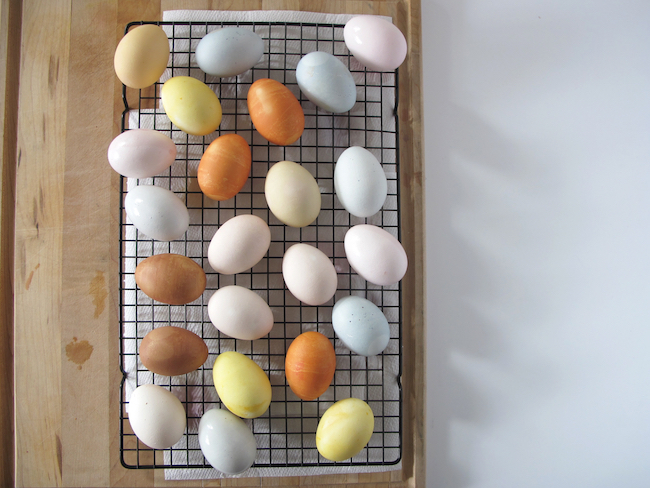 The end result of the dye will vary depending on the colour of your eggs, how concentrated the dye is, how long the eggs are immersed in the dye and the intensity of the colour of the vegetables that you use. 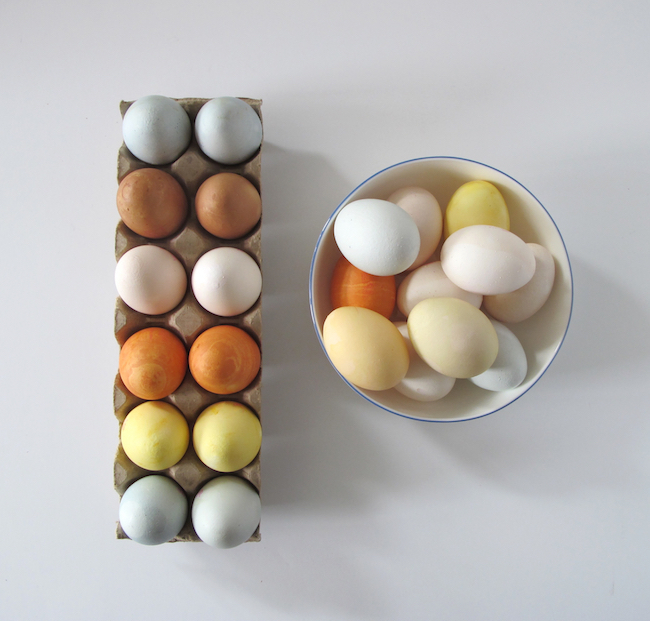 Don't forget that you can try experimenting by double dipping your eggs in multiple dyes to see what colours you can create. 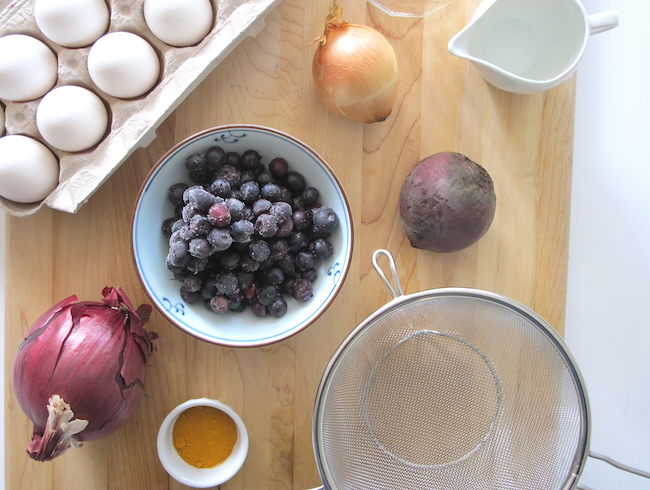 We used red and yellow onions, beets, frozen blueberries and turmeric. *Note: If you plan on eating the hard-boiled eggs please make sure you keep them refrigerated or if you want to keep them indefinitely (and you're patient!) 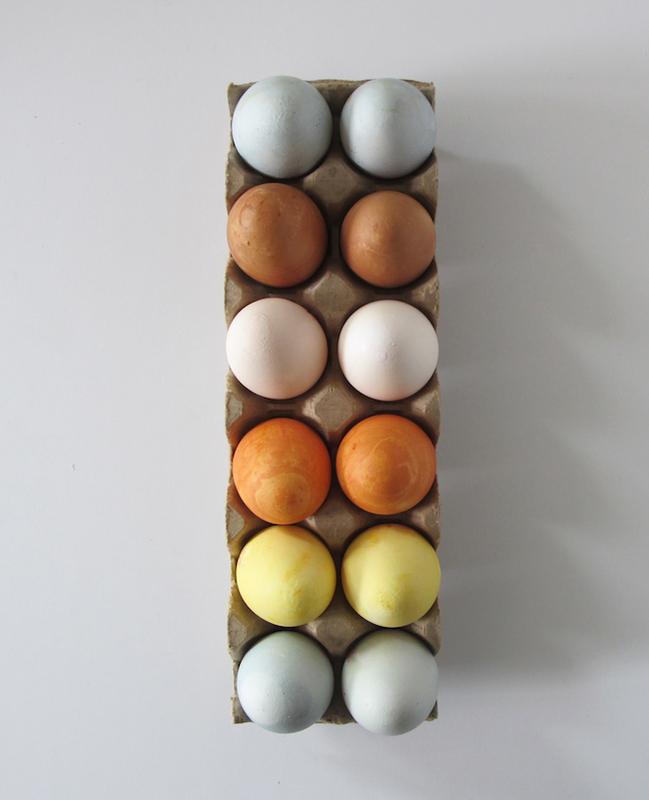 plan on taking the time to blow the yolks out of the egg shells before dyeing. Follow each recipe using the ingredients below to create these natural dye colours. Natural dyes can have unexpected results, so don’t be surprised if the colours vary. 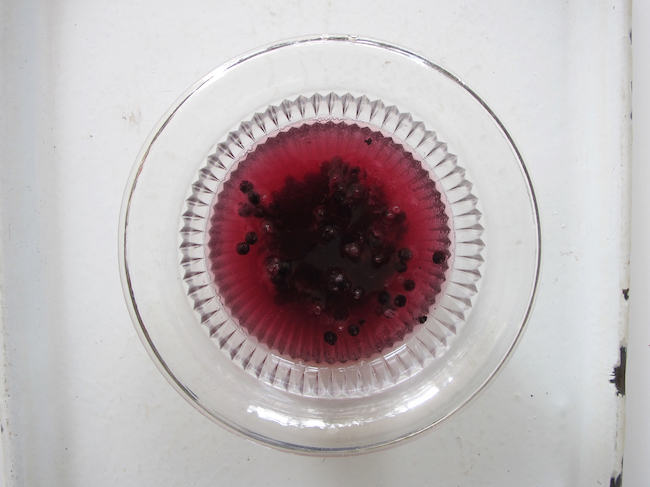 Combine 1 cup of frozen blueberries (wild blueberries work best) with 1-cup cold water. Let the berries defrost and come to room temperature in the water. Mash the berries gently to release their entire colour. Add one tablespoon white vinegar. Remove berries from liquid using a fine mesh strainer. Remove paper skins from six red onions and simmer in two cups of water for 15 minutes. Remove the skins from the water. Add 3 teaspoons of white vinegar. Let cool. Cut one large beet into chunks and add to four cups of boiling water. Stir in two tablespoons of white vinegar. Let cool to room temperature. Remove beets with slotted spoon. 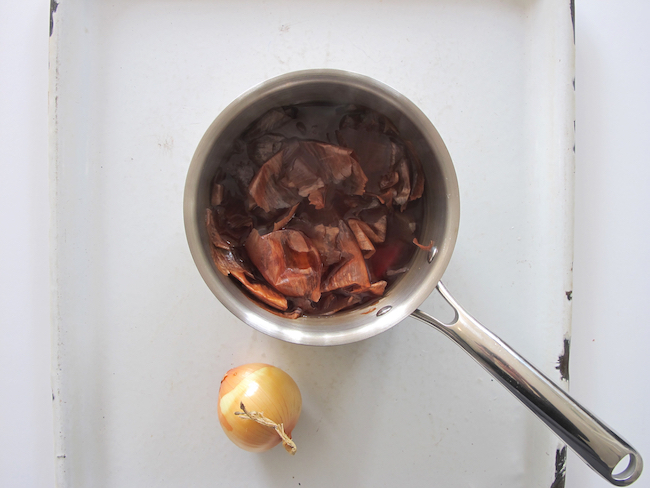 Remove paper skins from six yellow onions and simmer in two cups of water for 15 minutes. Remove the skins from the water. Add 3 teaspoons of white vinegar. Let cool. Add two tablespoons of ground turmeric to two cups of boiling water. Let steep for approximately 20-30 minutes. Add vinegar to the mixture and stir. 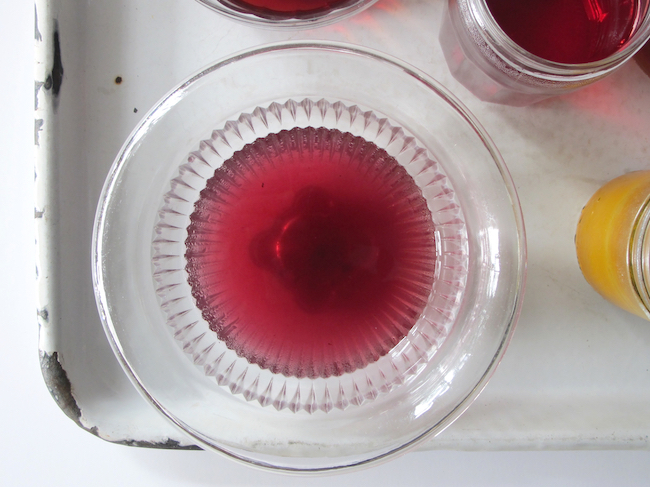 Pour the strained, cooled dyes in clean glass jars or bowls. 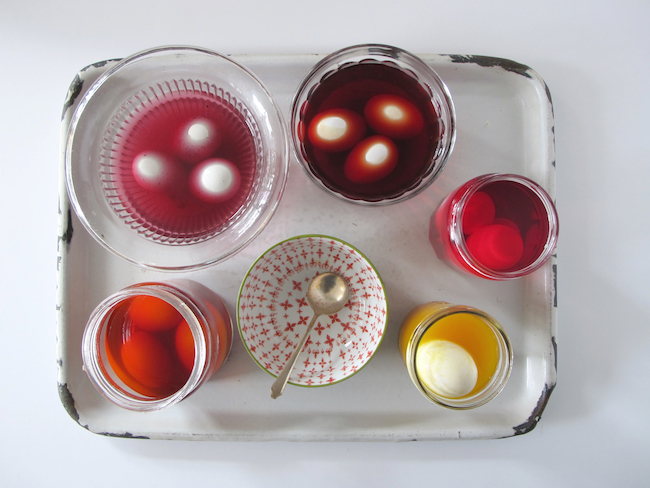 Add cooled hard-boiled eggs to the dyes and let the eggs steep in the dye until desired colour is achieved. 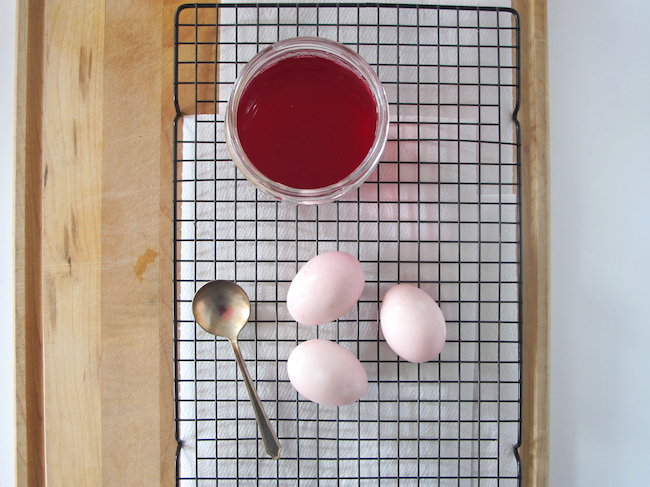 Remove the eggs from the dyes with a slotted spoon and let dry completely. 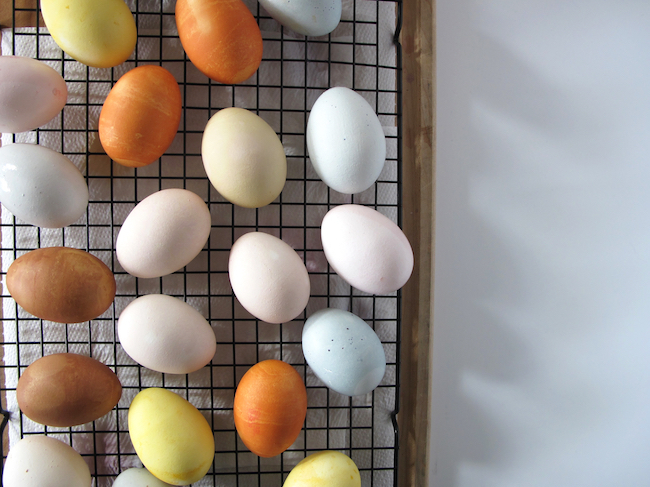 We used a cookie cooling rack with paper towels underneath to catch any extra drips of dye and let the eggs dry..
You'll end up with really pretty coloured eggs that you can display on your Easter table. 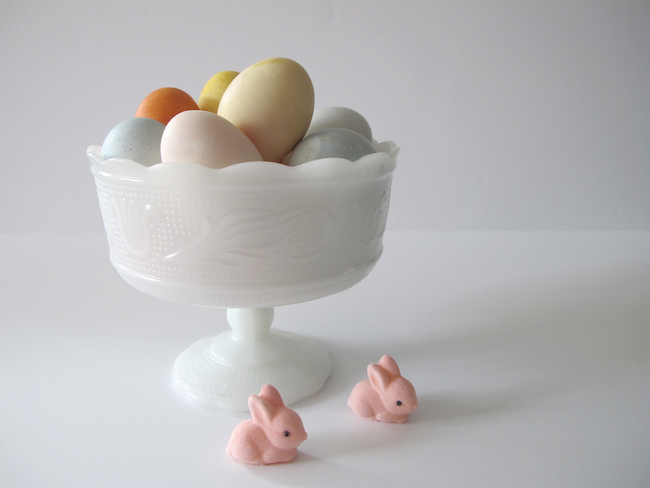 Gather the eggs inside a vintage compote or bowl and set in the centre of your table. 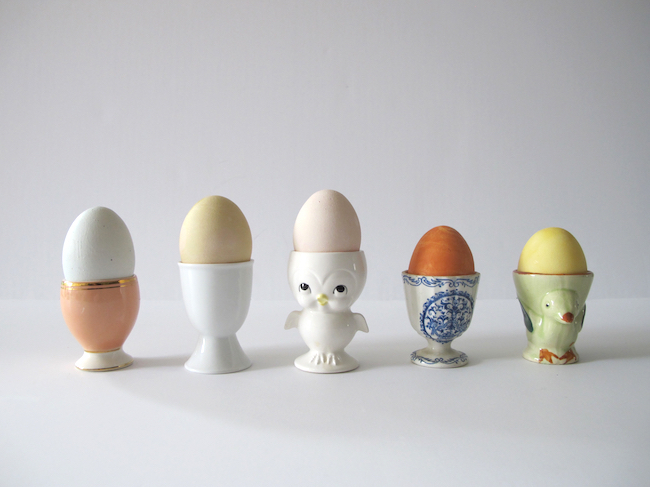 ... or pop them inside vintage egg cups and display them along the centre of a table or at each place setting. It’s that time of year where it can feel like we’re straddling winter and spring. One day we’re wearing our winter boots and the next day our wellies. Whether you have a tiny entryway or a spacious mudroom, this hardworking space has a lot to handle - and look stylish too. It's a space that can easily become a dumping ground for everyday items. With a little planning and organization you can create an orderly and stylish entryway as well as comfortable and stylish spot to come home to. 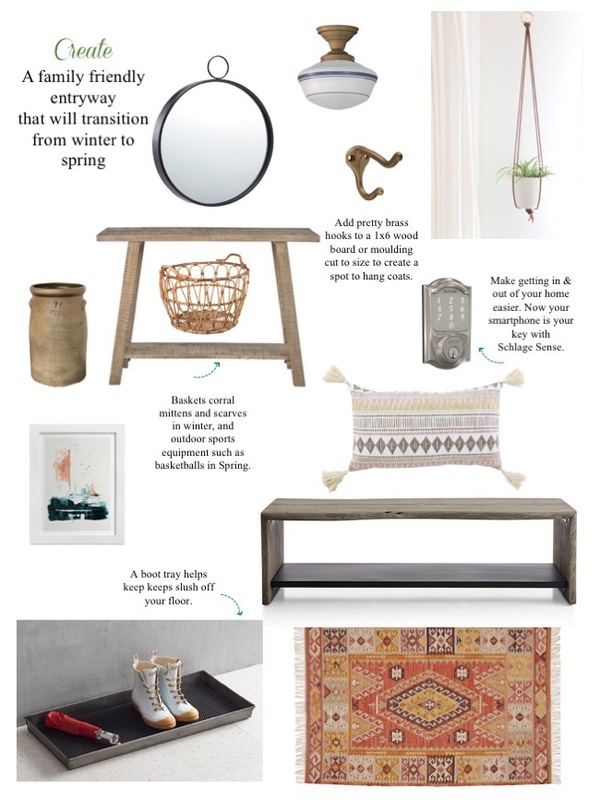 I’ve partnered with Schlage Canada to create an inspiration board, and share some tips on how to create a family friendly entryway that that will easily transition into spring. When you walk through the door, it's useful to have a spot to put down your belongings. If you have the space, a slim console table is a nice addition to an entryway. It also serves as a place to add a catchall dish for loose change, sunglasses or keys, and perhaps a basket for mail. However, if space is tight, a shelf hung securely on the wall, placed just below a mirror, can serve the same purpose. Include a place to hang coats. Outfit your entry with storage solutions. Not everyone has space for a built-in closet or a bulky armoire to hold coats. So, if space is tight, use your walls and create a wall mounted coat rack. Add pretty brass hooks to a 1x6 wood board or moulding cut to size - to create a spot to hang coats, hats and totes using vertical space. Did you know that in addition to entry hardware, Schlage makes other hardware such as hooks, door knockers and even barn door hardware? Chic coat & hat hooks from Schlage Canada in an antique brass finish, would look great hung on an entryway wall. Make everyday life easier. Update your entry door with a keyless entry system. Raise your hand if you are often juggling bags while trying to unlock the front door, or your kids have forgotten their keys and they can’t get inside. Instead, enter an access code on the touchscreen to unlock the front door instead of searching your pockets for keys. You can share access with trusted friends and family - so there is no more keeping track of spare keys. Pair it with your smartphone and compatible with Apple Home, Alexa and Google Assistant too. That sounds smart to me. An entryway should also include a comfy spot to sit and put on shoes. If you have the space, make the most out of it with a bench that also includes storage. Whether it has built-in drawers or a shelf that will hold baskets and bins, it serves as a practical and comfortable spot. If space is tight, a chair can work and can easily be used in another room when extra seating is needed. You can never have enough storage, so try to include as much as possible in this hard-working space. Baskets that slide under your bench or console table can corral everyday objects like hats and scarves, shopping bags or kids’ stuff. If you can, give everyone in the family a bin or basket so they have a separate space for their gear. Add a small tray or decorative boxes on a tabletop to keep things contained and from feeling cluttered. A place for wet boots. Say goodbye to muddy floors. Place a boot tray near your front door so that there is a spot to slip off wet or muddy boots.This is perfect for this slushy time of year. An accent pillow always adds a simple and stylish update to a room,. Add one to a bench to add pattern, colour and a touch of comfy. A functional addition that also boosts light in a room, especially in a darker space. It also creates the illusion of the room being larger. A round mirror softens the angles of a space filled with the straight edges of a bench or table. Just make sure it's in proportion with the room. Although the entryway is often a very utilitarian space, you also want it to reflect the style of your home. So, add extra touches such as art, plants and interesting objects to personalize the space. Make an impact and set the tone for visitors. Family photographs, art and interesting objects can enhance and personalize this space. A planter filled with spring bulbs can sit on a console table or hang plants from the ceiling using plant hangers. These leather hangers are a nice, streamlined alternative to the popular macramé varieties. An antique crock serves as an umbrella holder. There sturdy and can handle wet umbrellas. Pick one up at an antique market. I’ve even seen them for sale on Kijiji. Add a combination of overhead and accent lighting. A semi-flush ceiling fixture adds much needed light in a space that may not have a lot of ceiling height. Add a small table lamp or wall sconces for softer accent and task lighting if you have the space. …. and include a spacious rug to wipe your feet. There is nothing worse than everyone coming in the door and trying to fit on a tiny rug because they don’t want to get the floors wet. So, don’t skimp on size. Place a good size indoor/outdoor rug in your entry. A rug also helps to define the space. Choose a material that works well for a high traffic area. Sisal works well, as does any flat-weaves. Chic indoor/outdoor rugs are now readily available, like this pretty clay coloured option with a pattern that will hide dirt. Disclosure: I’ve partnered with Schlage Canada in this sponsored post. All opinions and text are my own. 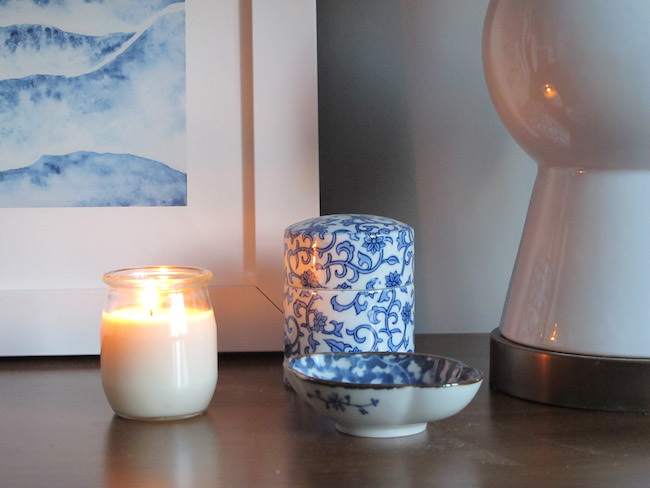 Cold January temps mean I'm burning a lot of candles. I always do at this time of year, but even more so now, after reading Meik Wiking's book The Little Book of Hygge: The Danish Way to Live Well. 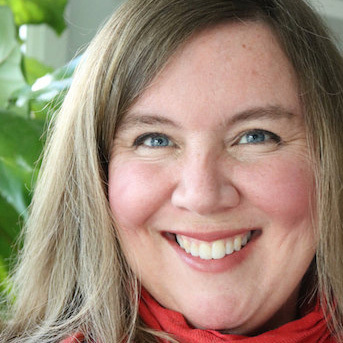 I read the book as part of some research for a story I wrote for The Toronto Star, on hygge style entertaining. 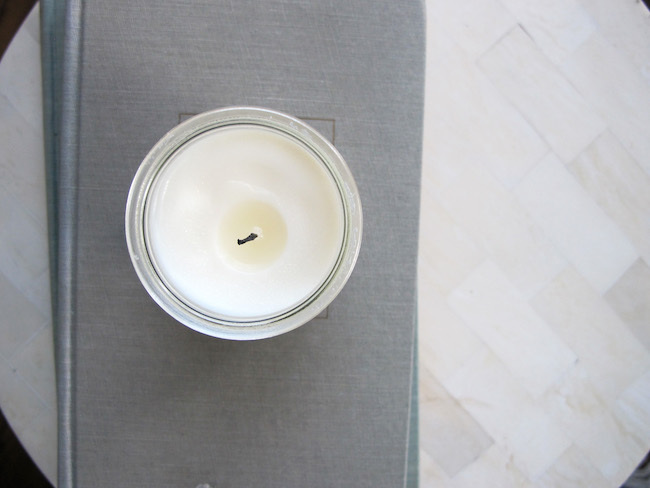 So, in the spirit of hygge (candles are essential!) 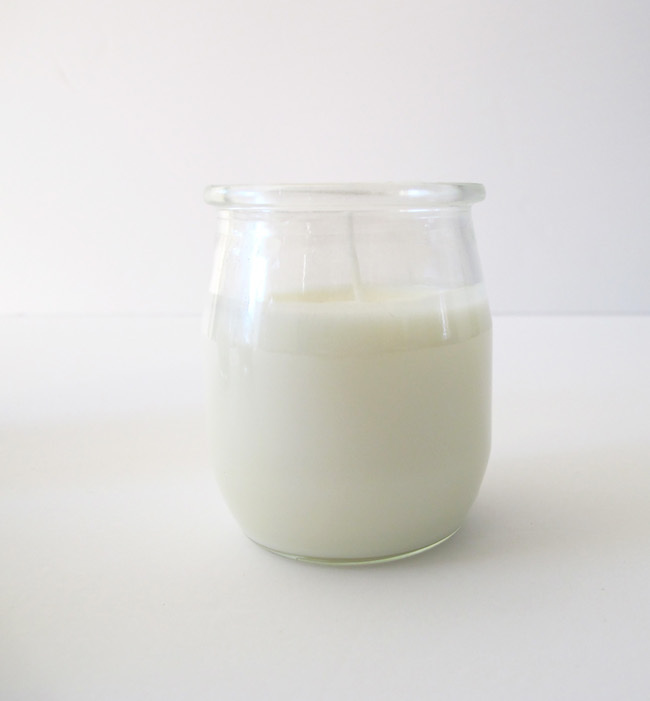 I thought I'd share this easy, soy candle diy that uses recycled jars and cotton wicks, which are a healthier alternative. 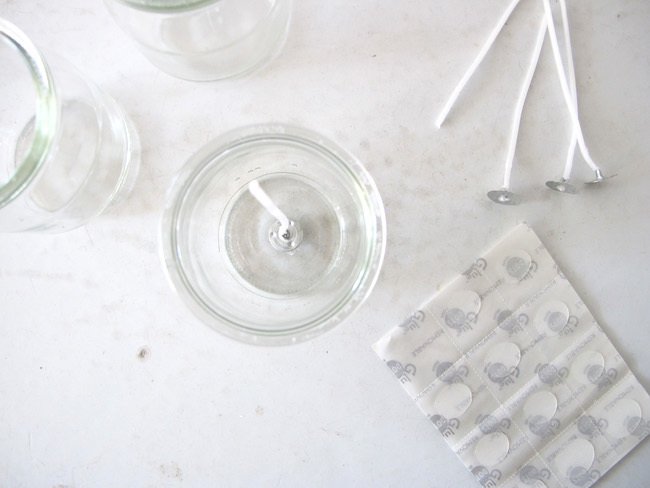 Get your jars (clean, obvs) prepped by gluing the cotton wick inside the bottom of the jar. I used glue dots to hold the wick in place. Ensure the wicks are straight and centered. 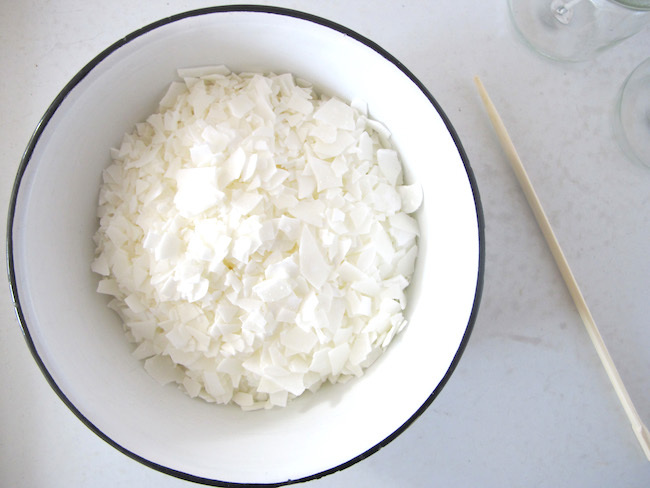 You're going to use a double-boiler method to melt the wax. To determine how much wax to melt, I found that if I filled the container I was using with wax and then doubled that amount, it was pretty accurate. One pound of wax filled four yogurt jars. 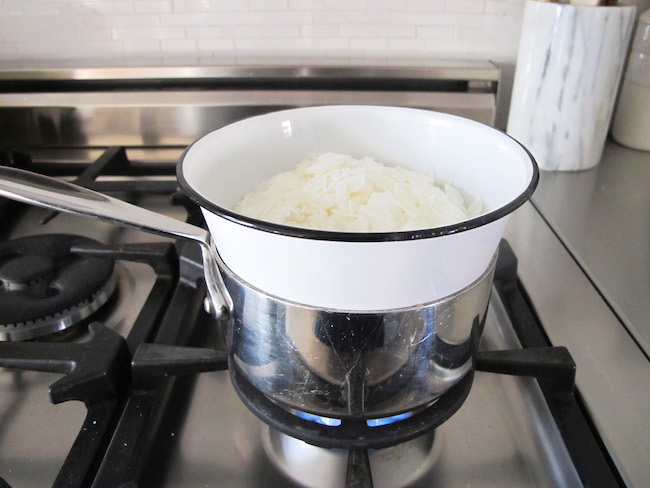 Bring a pot of water (approximately 1/4 full) to a simmer. Put the wax flakes in an old bowl. Make sure it's heat safe! 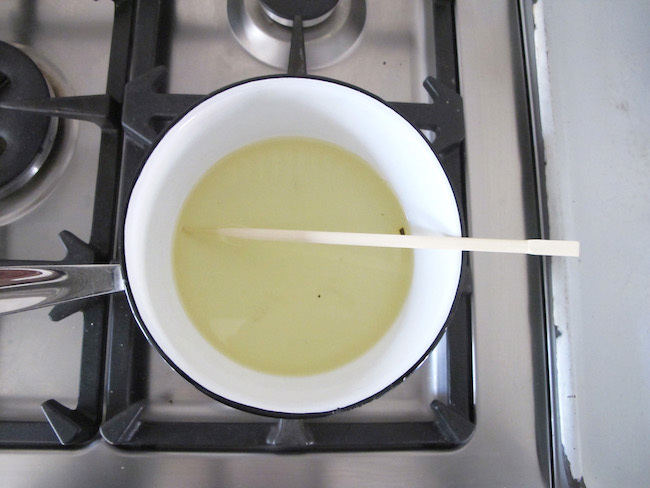 When the pot of water is simmering, place the bowl of wax in the pot. Melt the wax. Stirring occasionally with wooden stick. Make sure you can an eye on the wax so it doesn't burn. You want to slowly melt the wax over a simmer. 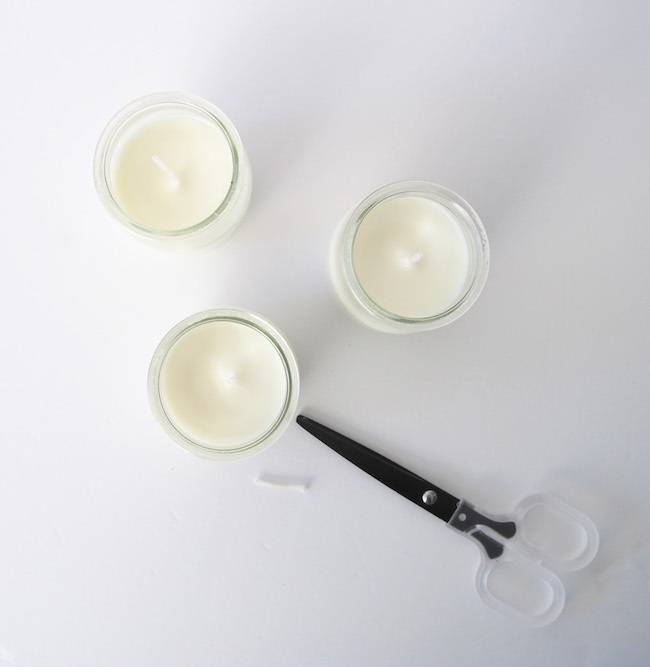 Carefully pour the wax into the prepared jars. 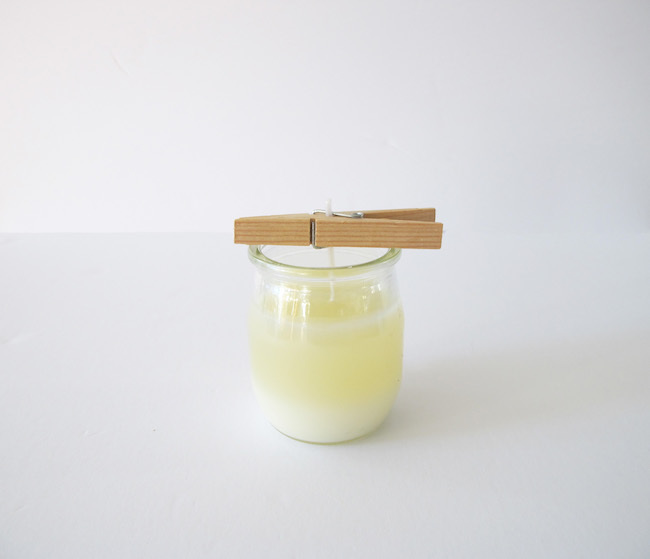 Using a clothes peg to hold the wick in place. Let the wax cool slightly. 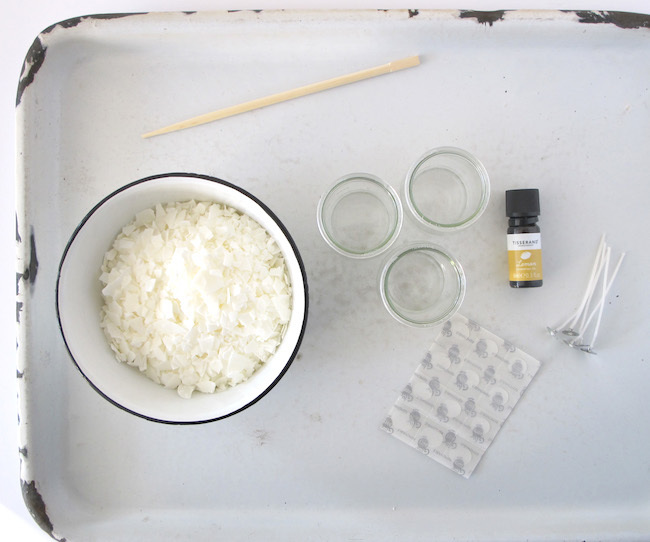 Once the wax has cooled slightly, add the essential oil. 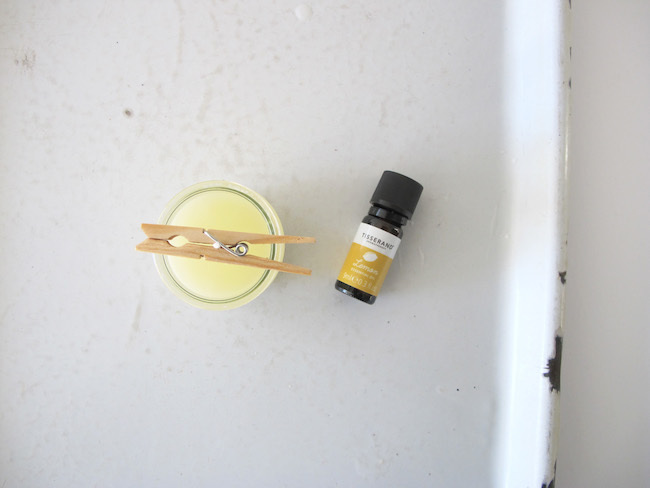 You don't want to add the essential oil while the wax is hot because I'm told it can alter the fragrance, but don't wait too long or the wax will set. The amount of essential oil that you add at this point is really up to you. I used about 10 drops per jar. 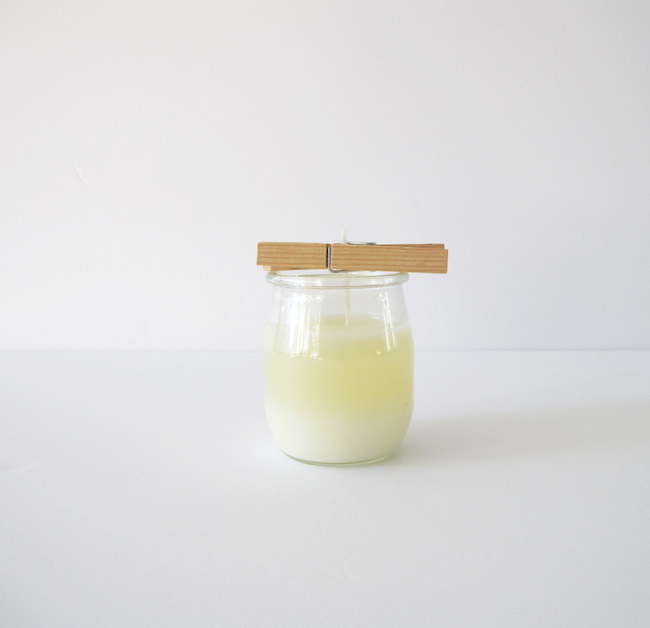 Gently stir the oil into the wax and let it set. It will take approximately 24 hours for the wax to set completely. 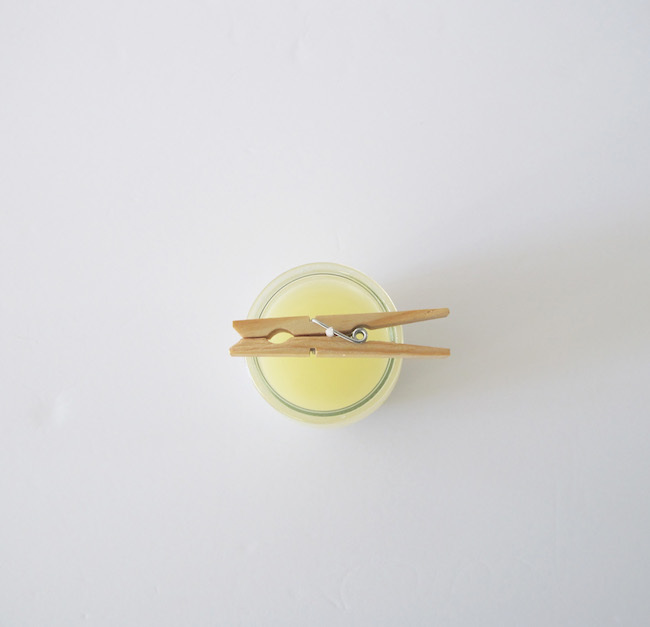 After the wax has set, remove the clothes pegs and trim the wicks to approximately one inch and enjoy! *Some of these images were originally part of a story I did for The Toronto Star. Hi, I'm Debra. 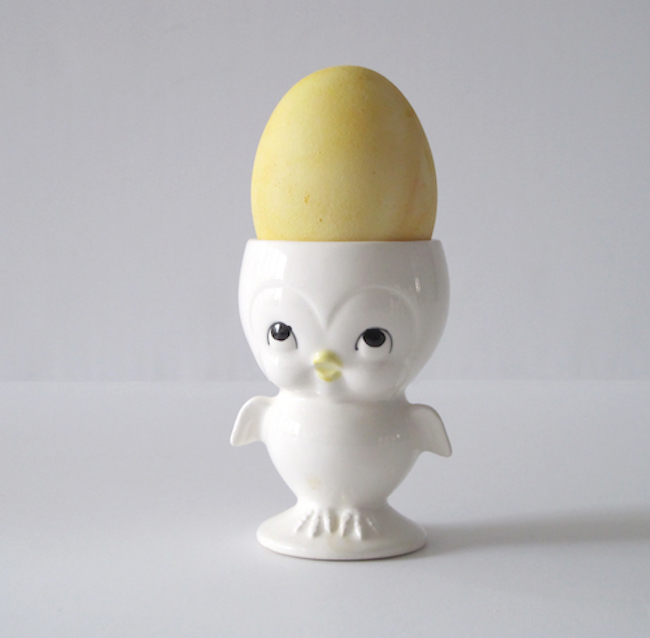 I'm a stylist, writer, maker and I love hunting for vintage treasures.